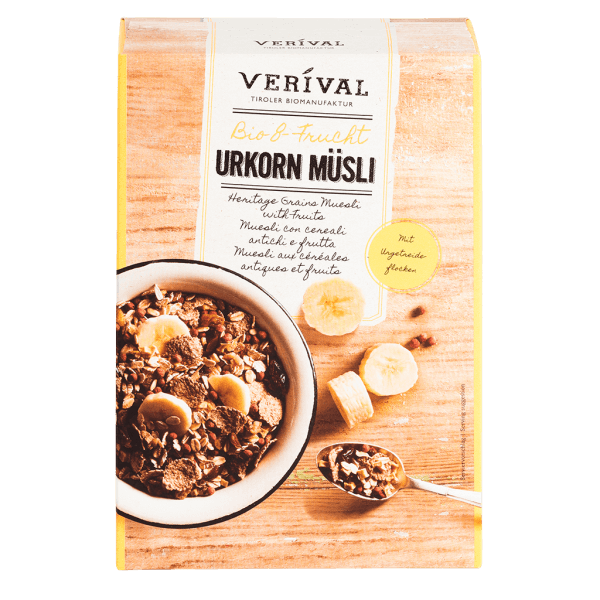 Flaked wholegrain oats and Verival wheat from our contract growers, bran flakes and chokeberry & elderberry rice crispies, blended with sultanas, apricots, bananas, plums, cranberries, diced apple and raspberry pieces. Deliciously fruity and 100% organic. Good morning! Fruits* 40 % ( sultanas* (sultanas 99,5%*, sunflower oil*), apricots* (apricots* 97%, rice flower*), banana pieces*, plum pieces* (plum pieces* 97%, rice flower*), cranberries* (cranberries* 60%, cane sugar* 39%, sunflower seed oil*), apple cubes*, raspberries*, oat flakes*, wheat flakes*, puffed rice with elderberry* 10% (puffed rice* 61% (rice flour*, sea salt, barley malt flour*), glucose syrup*, elderjuice concentrate* 13%, elderberry powder* 7,5 % (elderjuice concentrate*, cornstarch*), sunflowerseed oil*), wholegrain flakes* (wheat*, wheat bran*, cane sugar*, barley malt extract*, salt). > May contain traces of nuts, sesame seeds and soy.